"All Khun had was his brother. Now he'll risk anything to get him back." 14-year-old Khun and his older brother Monu are the last remaining members of the Osun, a race of tribesmen wiped out by the Rajenti. Forced into hiding among the Rajenti city-states, Khun and Monu scrape out a living on the streets, working where they can and stealing what they need to survive. But to the Rajs, self-proclaimed gods of the Rajenti, the brothers are a threat. If an Osun breaks a bone, he is able to use the Os, a powerful magic that can manipulate matter to devastating effect. When Monu is captured by a Raj's soldiers and taken through the wild Interlands to the capital of the Rajenti Empire, Khun sets off in pursuit. Hunted by enemies both horrifying and deadly, Khun will have to rely on his wits to rescue his brother. But there are many threats in the Interlands, and not all of them are human. False Gods has not been tagged yet. Help others find False Gods by tagging it! False Gods has not been reviewed yet. 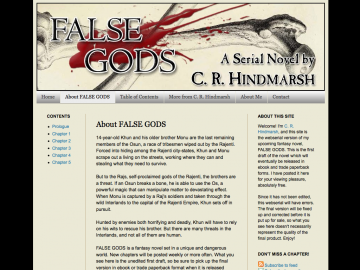 False Gods has not been recommended yet.